I just wanted to let you know that Angel did a beautiful job with Quinn's grooming and Lola's nails. She was calm, patient with the dogs, professional and kind. I look forward to our next appointment! I cannot tell you how happy I am that you cared so well for Gucci and Zac. I know you did because I can see they miss you. They are happy to be home but I can see they had fun at your place and probably miss the action you gave them. look so great for me. I also want to say thank you for the new toy you gave them, it is really cool with lots of sneaky parts that they enjoy chewing. How can we thank you enough for being so kind and loving to our little darlings. Without your comforting presence, they would habe been so anxious; our enjoyment of my son's wedding wouldn't have been possible if that had been the situation. We feel very lucky to have found you and will certainly call on you again, You're a lovely person! I was so impressed by the great care mutsy had.It was very reassuring to know that he is with someone who really cares to take good care of him.Mutsy has been part of our life for almost 14 years.Thank you so much .We could not have asked for better care. We hope you will be available in the future to help us again taking care of him.Thank you so much. All the best wishes to you. My mother, a senior, who have difficulties to bring her favorite cat Martin (a 10 year old maincoon/bobtail mix, who weights at least 20 pounds) to a groomer, was serviced by you, at the comfort of her own apartment today. I got a call from my mother who exitedly told me, about "your magical touch and amazing ability to deal with a cat like Martin"! 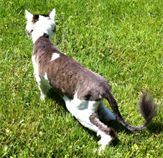 Usually, Martin growls and trying to escape when a groomer is reaching out to him, but not with your approach! Martin was calm and relaxed and even let you to treat his ingrown nail! Thank you for your professionalism and great skills! You made my mother, myself not to mention Martin very happy! ​My 20 year old long haired cat has had increasing difficulty grooming himself and developed terrible mats all over his entire body. 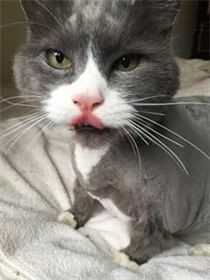 I was thrilled to find A1 Pet Grooming and learn they made house calls, which would greatly minimize the stress for my elderly cat. Junko arrived right on time and did a fantastic job! She worked quickly but gently, and kept Duke as calm as possible. When I've dropped my cat off at other groomers, I'm required to leave him there for most of the day. But Junko was finished in two hours and got rid of ALL of the mats! She bathed him as well, and he smelled wonderful afterwards. Duke is so much more comfortable now, he seems like a new cat! I only wish I had called A1 groomers. I would recommend them to anyone!" 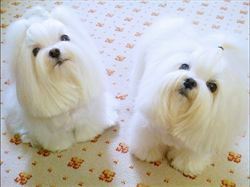 ​A1 pet grooming.......recommended by my breeder. They are so wonderful. I would not leave my dog at a groomer. 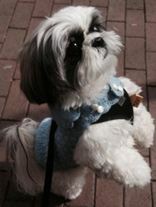 I feel so confident with A1 pet grooming coming to my home and grooming my Mason while I am there. I recommend them. 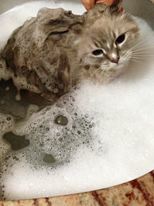 ​"Groomers from A1 Pet Grooming grooms my Birman Sasha. Sasha had many mats on her chest and her belly,It was impossible to comb out but they were able to get them off completely! I'm looking forward to see them again!" Lily was an ecstatically happy after as you can see in the picture.. Thank you A1!!! Thank you !! Part 2 - A1 Groomer did yet again another wonderful grooming job on Lily!! Lily really started to take a liking to her; and with this being the 4th grooming by her it just gets easier as Lily is very comfortable with her. I used to groom my havanese once every three months, but as the type of coat this havanese and other similar silky hair dogs go, doing it every 4 weeks has definitely shown much improvement in her hair quality & ear health. A1 groomer takes her time with Lily and is meticulous in making sure the cut is straight & even (I have friends who have worked for "shop" groomers & they can be very fast & mechanical & careless). What I like best is that she can talk to Lily in such a cute voice (Japanese and English lol) and Lily eats that up (with treats to haha)...thanks again & I always look forward to her next appointment!! A1 groomer has been cutting Lily for 6 months now since march (cuts spaced 4 weeks apart).... and every cut is better than the last!! She suggested to keep her hair slightly longer for the upcomming fall, and altho it was a short cut you can see it still is slightly longer than the last cuts....well done as always!! And again, the best part is that i am there the entire time & i can tell Lily is treated with respect & love. A1 Pet groomer is the best!! Lily has been getting cuts since march 2014 and every 4-5 week breaks per session. My 2 year old Havanese will always look like a forever-puppy because of her!! Once again A1 groomer did a wonderful job!! I have been living at home in Westchester from my NYC apartment while my parents are ill and A1 groomer came all the way from Manhattan to make the house call!! Lily was happy to see her... As well my mother has a rescue Chihuahua thats very skittish & overweight and needed a nail-trim and A1 groomer spent 15min just to get to know her and warm up to her before she flawlessly cut & filed her nails and cleaned her ears too!! 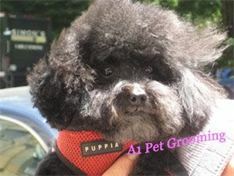 (A normal groomer would never do this: they always rush it in uncomfortable restraints)She really cares about animals, and of course with the professional Japanese haircutting skill!! Thanks again!! 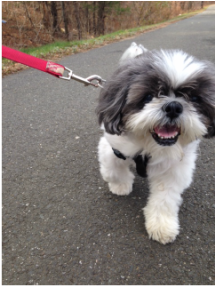 ​A1 Pet groomer recently groomed my little boy, Fred, an 11 year old Tibetan Terrier. Fred, who was rescued from a puppy mill, can be very difficult to groom because he is extremely shy and fearful with people. A1 pet groomer did an exceptional job not only with Fred’s haircut but she was also very gentle and caring while handling him. I’m looking forward to having A1 PetGroomer come again to groom Fred in the future! ​A1 groomers has been a godsend to our family! She gives the most fabulous hair cuts to my Maltese puppies, so much so that we get stopped in the street by people wanting to know who grooms our puppies so beautifully! Not only are A1groomer’s hairstyling abilities superior to any other groomer we have had, she has a wonderful innate understanding of and sensitivity toward animals. Because we trust A1 stylist so much, we are able to take worry-free vacations abroad and leave our puppies to her gentle and loving care. She is easily the most gifted person we have met in the animal world. She is extremely conscientious and has a wealth of experience; and she will truly love your pet the way that you do! Great Great job with my precious!I am so lucky to found you, Everybody on the streets compliments Prince and that makes me very proud!Thank you very much!!! !You are the BEST!!! Mr. Big and I (his Mother) are very grateful for your perfect care, excellent grooming and warm and loving attitude. I (Mr. Big) love you even though I did not like grooming before she came. 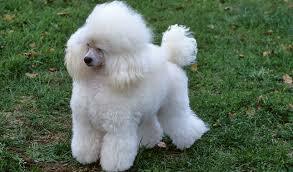 Now I know she will treat me like a prince and when I am groomed I look fantastic. I know this because I am stopped on the Street all the time and told this! We really recommend her to everyone! 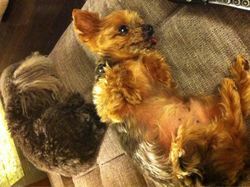 You have been my Yorkie's groomer for nearly 11years.I only have praise for her work ethic. For the past few weeks, one of A1 groomers has been grooming Plume, my Yorkie. She called my attention to what I thought was a pimple and urged me to go to see my veterinarian. What we discovered was a tumor, Plume required immediate surgery. ​A1 groomer has served in that capacity for past four years. 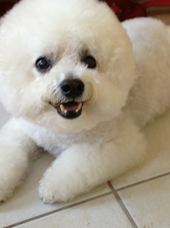 (as of 2006) She is gentle and caring with Bebe, our Bichon frise. She consistently does an outstanding job, so much so that people stop us to ask us where he has been groomed. A1 groomer is reliable, yet flexible, and service oriented. She is trustworthy and dependable. I have been impressed with her commitment to her profession, notable by her continuing education related to pet health, grooming, training, etc. She is a delight to work with and I recommend her without reservation. 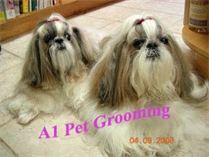 Groomer from A1 has been coming to my home to groom my two Shih-Tzus for about five years now (as of 2008) . I recommend her services wholeheartedly and without reservation. She is an experienced, highly qualified, and talented groomer. She asks me each time how I would like my dogs’ cut to be and executes my wishes skillfully and efficiently. They always look great!One of my dogs is frightened of just about everything. I could never bring him to a grooming salon, he would panic and no one would be able to get their hands on him.Once at my vet’s, it took about 40 minutes just to clip his nails! She used love and patience to groom this dog. In the beginning, she spent close to two hours grooming him, now it takes her less than one hour! She is the perfect groomer if you are a pet owner who is worried about grooming salons, either because your pet is sensitive or because you don’t trust what goes on there.It is far less stressful for me and my dogs to have them groomed at home by a trusted and familiar person. She is reliable, respectful, honest and a true animal lover.If my dogs could talk and write, they would give her a rave reviews. 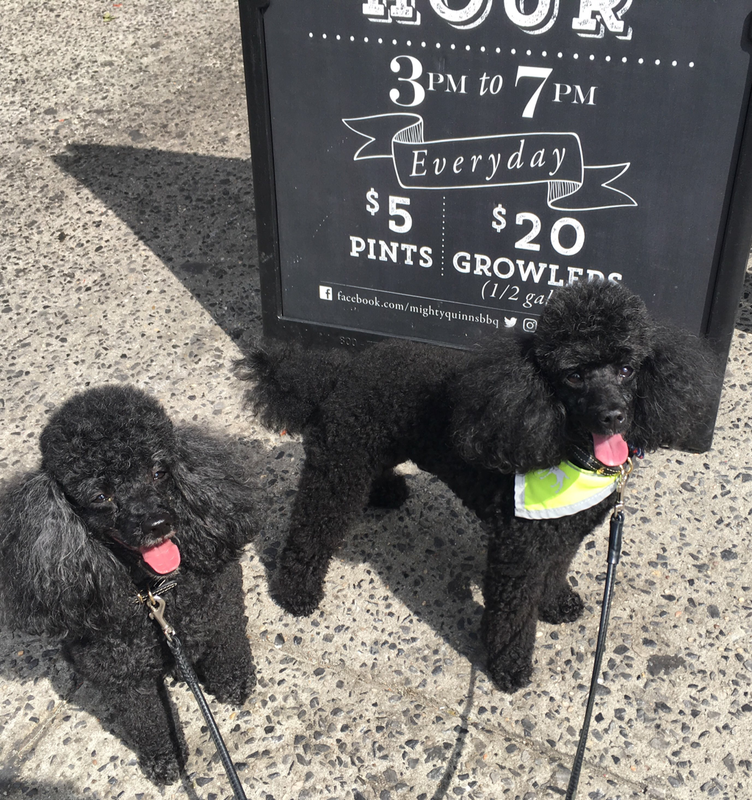 ​When we gave my mom her poodle ‘Jetty,” my Veterinarian recommended you to my mom and that was five years agoYou have been wonderful with our Jetty and with my mom. When you are done grooming him he is looks so handsome and he knows it. Everyone that sees him as only but compliment to say and how handsome he looks.My mom Carmen Padilla and I Marisol Andino are so happy to have found you, it’s always a pleasure having you come to my mom’s home and you care so much about our poodle Jetty who is part of the family. I appreciate the fact that she is very receptive to my comments and wishes and is very reliable. I recommend her highly without hesitation. 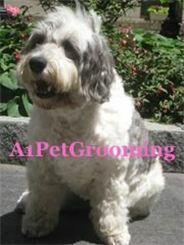 ​"Recommendation for a Wonderful and Professional Certified Pet Groomer"
Sam is my 12-year-old Polish Lowland Sheepdog and A1 groomer has been grooming him for the past five years. Sam has a skin condition that requires very special care. He needs to be groomed at home by someone who is very experienced and who also loves animals. She is everything I hoped for to care for my dog. She has provided the most tender and professional grooming in a challenging situation. When she leaves our once a month appointments, Sam is calm, happy and looks wonderful.Recently, She bathed Lola, my Himalayan 14-year-old cat for the first time and gave her a lion cut. Lola looks adorable and ready for Summer. It is very reassuring to know that I have found A1 the most caring groomer who treats animals gently, lovingly and respectfully. She is a joy to have in my animal's lives. 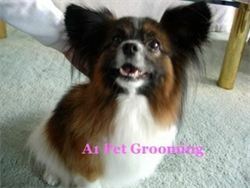 ​A1 groomer has been grooming my Papillon for the last three years. 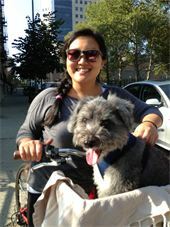 (as of 2004) I am very pleased with the way my dog looks and with the professional and caring way she handles the dog. ​We started having A1 groomers wash and style our cockapoo Chester five years ago (as of 2004) when he was a puppy. We were thinking that we'd get him comfortable with at-home groomings while he was young and then switch him to a conventional dog grooming salon as he got older. Well, we got hooked with the individualized touch. We also came to see the merits of being there for each cut. Every one of the A1 employees is an artistic, caring person with not only the haircut-- but the dog's temperament and happiness in mind. We're continually left with a fluffier, cuter, calmer Chester. Thanks to A1! We feel blessed. I cannot say enough nice things about A1 groomers. They are professional they leave both my house and my animals in perfect shape. I am always getting asked who grooms my dogs they are always perfect. They greet her with hugs and kisses so I know they are being treatedwell. 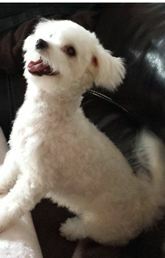 I trust her completely with my home and my animalsI highly recommend A1 pet grooming and her groomers. 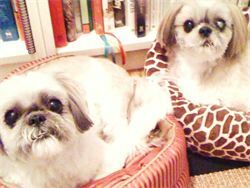 ​A1 Pet grooming has groomed our two shi-tzus for the past 15years. She is an extremely competent and efficient and thorough groomer who has won the affection and trust of these two sensitive dogs. In addition she has earned out trust by virtue of her promptness, diligence, reliability and honestly. Her professional skills extend to long haired cats as well, due to her extraordinary capacity to relate to animals. I am so glad I found you. I don’t know what I would have done without you. 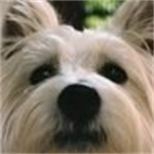 I’ve been at my wit’s end going from groomer to groomer in New York (the fancy shops, I might add, and at a very high price) and my poor Westie has always comeback looking a mess. If it wasn’t clipper burns (even after I ask ‘not’ to have him shave electrically) they cut off too much hair and made a general mess of things. And let’s not forget the trauma he experienced being “cooked” with a hair blower. 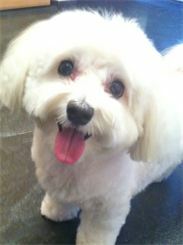 Since you have been grooming Duffy, he looks like the adorable dog he is. You even know how to “cosmetically” cut hair to make certain “ears” looks smaller! It’s always a pleasure having you come to my home, like a member of the family. Your way of handling nervous dog is wonderful. You always have a solution to any problem that I feel we have with the condition of Duffy’s skin and coat. Thanks for all your great work! 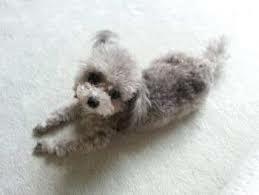 I will certainly recommend you to all doggie friends and relatives! 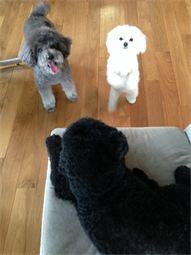 ​A1 grooms my toy poodle, Brandi. 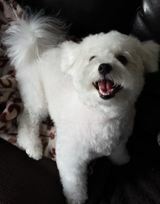 Here are some comments to describe A1 groomers and her work: Very professional and talented: gifted with a loving calming way with our dog: highly creative in her styling and our home and our dog are left in an immaculate condition. Brandi is always happy to see A1 groomer and when she is about to leave, showers her with love.